My husband loves to leave pens all over the kitchen. I don't mind one or two, but when you have an assortment of five or six or twelve of them all over you know it's time to find them a home. Thus began my quest for a pencil cup. I wasn't anticipating a craft project, but I found this cute, simple wooden pen/pencil-holder and decided it would be fun to paint it! I really liked the wood look so when I slapped on the green paint I kept it watered down and thin so the wood could show through. 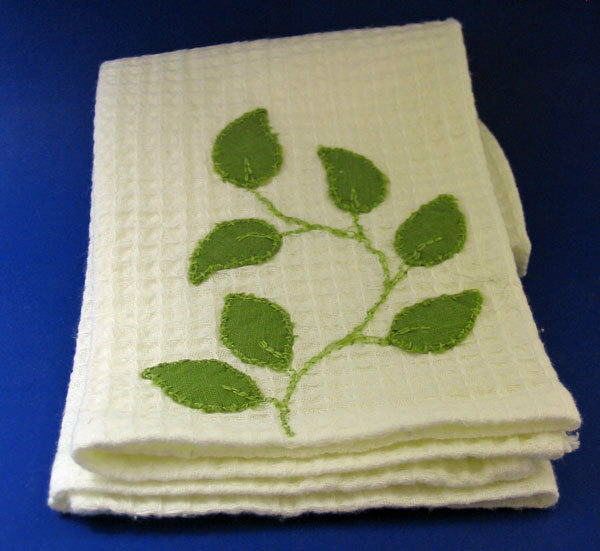 The white leaf detail was added because the plain green looked sad and lonely. 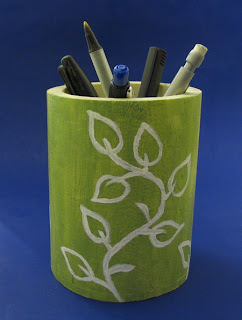 After I made the pencil cup I decided I needed to make... a matching dishtowel! The leaves are made of green linen scraps and the stem is green embroidery thread. I acquired the plain white towel at Target.